Hello friends and welcome to Nonna's Craft Corner! I'm happy that you stopped by because I have another fun card to share with you. This card has more of my friend, Tatiana's beautiful hand-crocheted flowers! If you missed yesterday's post that featured one of her beauties, you can see it HERE. And, if you would like to visit Tatiana's Blog and learn more about her beautiful embellishments, just hop over to Created By Tatiana. * Mats - Spellbinders - "Eyelet Squares"
Tatiana has just created a store at Etsy for her crocheted embellishments. You can see her store by clicking HERE. Please keep in mind that she is adding to her stock daily and will take custom orders for any special colors you may need! Thanks for taking the time to pop by for a visit. I always appreciate your visits and look forward to your sweet comments! This is just a beautiful card. Great colors to put a smile on one's face. 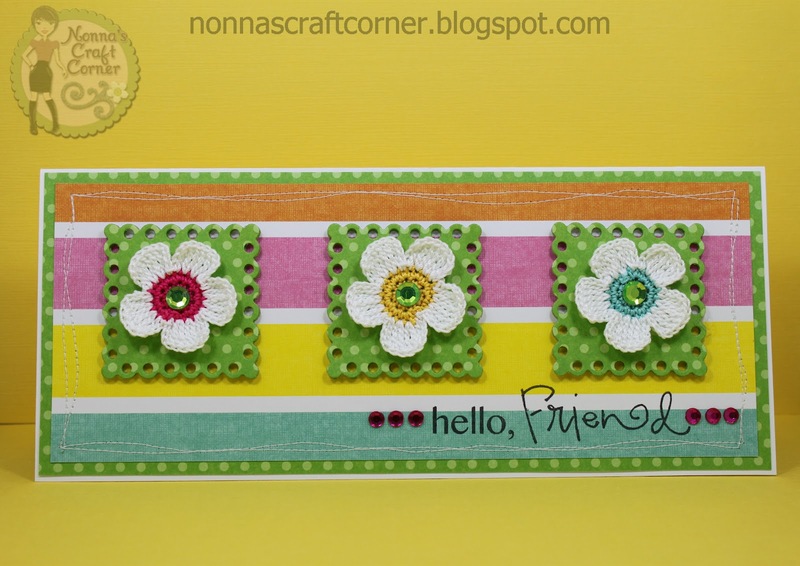 I love the way you framed the flowers with the Spellbinders eyelet squares. Soooo cute! This card is adorable. I love the flowers and the mats are so cute! So bright and cheerful! Adorable card:) LOVE, LOVE the flowers and the design is beautiful:) Great job! Adorable card, I love the flowers. Love this cute card. Great paper. Those die cuts really showcase the flowers beautifully. 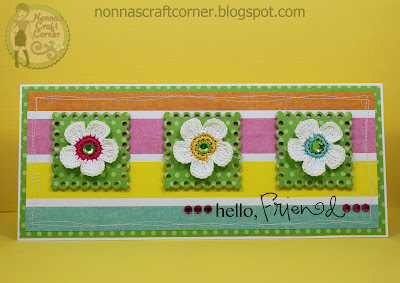 Those flowers really are gorgeous and your card shows them so well.Love your stitching. Beautiful card, Tanya! I am so flattered that you used my flowers, and what a great way to show them. Thanks again. Wow Tanya! The card is gorgeous and I really love those beautiful flowers!! !